What is the purpose of a birth certificate? It’s time to begin a national dialogue on the purpose of a birth certificate. Sounds like a silly question, maybe? But, if you are someone who was adopted or who is an adoptive parent or who is the birth parent of an adopted person, the question probably isn’t silly at all to you. An integral part of Ampersand Families’ mission is to advocate for improvements to the child welfare system, and to challenge barriers to permanency for older youth. To this end, Ampersand Families has partnered with Twin Cities Public Television to put a spotlight on this issue. So, in honor of all people who are living the complexity of adoption and the many implications it has for identity and belonging, Ampersand Families is proud to release this animated essay to begin the dialogue…. The Birth Certificate from Ampersand Families on Vimeo. Birth certificates perform a variety of functions in our society. They tell us who we are, where and when we were born, and to whom we were born. For most of us, a birth certificate is an immutable document that guides our identity; allowing us to receive a social security card, a driver’s license, and a passport. Did you know that in most states, a child’s birth certificate is legally changed to remove birth parents and add adoptive parents when an adoption is finalized? Changing a birth certificate may not sound like a big deal, and it may even sound logical, but for many older youth in the child welfare system, it can be viewed as an attack on their identity. In fact, for some youth, changing their birth certificate can even become a barrier to a permanent family. For decades there has been an ever-growing movement to unseal the original birth certificates of adopted persons. Ampersand Families unequivocally supports those efforts towards honesty and openness. With this effort we begin to raise the question…ought birth certificates be amended in the first place? Is the birth certificate the right place to record adoption and, if so, are there other ways of doing it that might help adopted persons retain their whole selves even as they move from one legal family to another? 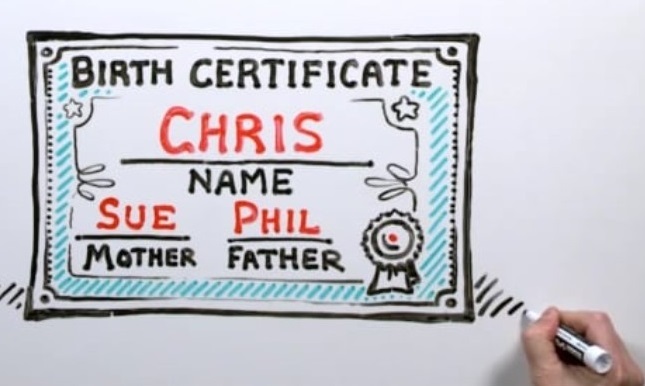 As we explore the idea of the purpose of a birth certificate, so many questions emerge. For instance, if the birth certificate is intended to be an accurate record of biologic facts, ought we be moving towards honoring and name surrogates, sperm and egg donors and others who play a vital role in the creation of a child? If you would like to learn more about this topic, please read the eye-opening White Paper prepared for Ampersand Families by Alicia Lanars. The document does an incredible job of showing the wide variation from state to state in how birth certificates are amended at the time of adoption. Our laws are a complete tapestry of every imaginable combination, most bending and smudging and tweaking the identity and story of adopted persons. Please share this video with others, including your state and national legislators. Talk about it with your friends. Then, contact us with your thoughts and ideas for next steps. Thanks for helping get the conversation going.